^ Toy Story. British Board of Film Classification. [2013-08-02]. ^ Toy Story (1995) - Financial Information. The Numbers. [2014-12-07]. 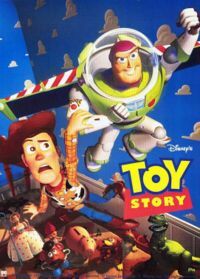 ^ 3.0 3.1 Toy Story (1995). Box Office Mojo. [2010-02-18]. ^ 4.0 4.1 4.2 Price 2008, p. 121. ^ 5.0 5.1 5.2 'Toy Story': The Inside Buzz. Entertainment Weekly. 1995-12-08 [2011-07-08]. ^ 6.0 6.1 6.2 6.3 6.4 6.5 Isaacson 2011, p. 208. ^ Toy Story. The Numbers. [2009-03-11]. ^ Toy Story Reviews. Metacritic. [2009-03-11]. ^ Toy Story (1995). Rotten Tomatoes. [2009-03-11]. ^ King, Susan. How 'Toy Story' changed the face of animation, taking off 'like an explosion'. Los Angeles Times. 2015-09-30 [2015-09-30]. ^ Librarian of Congress Adds 25 Films to National Film Registry - News Releases (Library of Congress). Loc.gov. [2013-06-10]. ^ Paik 2007, p. 38. ^ Paik 2007, p. 41. ^ 15.0 15.1 15.2 15.3 Isaacson 2011, p. 181. ^ 17.0 17.1 Price 2008, p. 117. ^ 18.0 18.1 18.2 18.3 18.4 18.5 Isaacson 2011, p. 206. ^ Price 2008, p. 118. ^ 20.0 20.1 20.2 20.3 Price 2008, p. 119. ^ Price 2008, p. 120. ^ Price 2008, p. 122. ^ Kanfer 2000, p. 229. ^ Cezary Jan Strusiewicz. 5 Insane Early Drafts of Famous Films. 2011-02-01. ^ 26.0 26.1 26.2 Price 2008, p. 124. ^ 27.0 27.1 27.2 27.3 Isaacson 2011, p. 207. ^ 28.0 28.1 Price 2008, p. 125. ^ Disney's Buzz Lightyear and Wall-E explore space for NASA. Space.com. 2008-06-24 [2009-03-13]. ^ Paik 2007, p. 103. ^ 31.0 31.1 Price 2008, p. 126. ^ Charlie Rose. Charlie Rose Interview of John Lasseter. 2011-12-02 [2016-11-21]. （原始内容存档于2011-12-08）. ^ Price 2008, p. 127. ^ 34.0 34.1 Price 2008, p. 128. ^ Price 2008, p. 137. ^ 36.0 36.1 36.2 36.3 36.4 36.5 Toy' Wonder. Entertainment Weekly. 1995-12-08 [2009-03-11]. ^ Evans, Bradford. The Lost Roles of Jim Carrey. Splitsider. 2011-03-17 [2016-03-28]. Early in Toy Story’s development, producers wanted Paul Newman as Woody and Jim Carrey as Buzz Lightyear, with the two actors representing Old Hollywood and New Hollywood, respectively. ^ Fischer, Paul. Billy Crystal – Cranky Critic StarTalk. [2009-03-11]. （原始内容存档于2001-12-18）. ^ Pearlman, Cindy. Crystal clear on 'Monsters' (Fee required). Chicago Sun-Times. 2001-10-28 [2009-03-16]. ^ Evans, Bradford. The Lost Roles of Bill Murray. 2011-02-17 [2015-05-25]. （原始内容存档于2015年5月20日）. ^ Farr, John. Bill Murray and the Roles That Got Away. The Huffington Post. 2014-09-19 [2015-05-25]. ^ THE FACES & FACTS BEHIND DISNEY CHARACTERS. E!. [2016-04-03]. ^ Kozak, Jim. Serenity Now!. In Focus (National Association of Theatre Owners). August 2005 [2015-08-10]. （原始内容存档于2005-08-03）. Ironically, Disney put the kibosh on the person they wanted for Buzz Lightyear because he wasn't famous enough, so we couldn't use Jim Carrey. But they had Tom Hanks in place. ^ Evans, Bradford. The Lost Roles of Chevy Chase. Splitsider. [2016-11-21]. ^ 46.0 46.1 Price 2008, p. 129. ^ Toy Story (10th Anniversary Edition) – (Making Toy Story) (DVD). Walt Disney Home Entertainment. 事件发生在 6:43. 2005-09-06. ^ Michael, Dennis. 'Toy Story' stars say being animated is hard work. CNN. 1995-11-25 [2009-03-12]. ^ Price 2008, p. 130. ^ 50.0 50.1 Price 2008, p. 131. ^ 51.0 51.1 Toy Story (10th Anniversary Edition) – (Filmmakers Reflect) (DVD). Walt Disney Home Entertainment. 2005-09-06. ^ Price 2008, p. 133. ^ Kronke, David. After 'Toy Story' Credits Roll, the Fun Comes Alive. Los Angeles Times. 1995-11-21 [2015-09-07]. ^ Isaacson 2011, p. 209. ^ 55.0 55.1 Price 2008, p. 151. ^ Programme 1996. Berlinale. [2014-12-06]. （原始内容存档于2014-10-07）. ^ 1996 Yearbook. Berlinale. [2014-12-06]. （原始内容存档于2014-12-05）. ^ Price 2008, pp. 139–142. Isaacson, Walter. 史蒂夫·乔布斯传. New York: Simon & Schuster. 2011. ISBN 978-1-4516-4853-9. Kanfer, Stefan. Serious Business: The Art and Commerce of Animation in America from Betty Boop to Toy Story. New York: Da Capo Press. 2000 . ISBN 978-0-306-80918-7. Paik, Karen. To Infinity and Beyond! 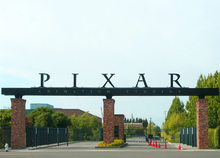 : The Story of Pixar Animation Studios. San Francisco: Chronicle Books. 2007. ISBN 978-0-8118-5012-4. Price, David. The Pixar Touch: The Making of a Company. New York: Alfred A. Knopf. 2008. ISBN 978-0-307-26575-3.